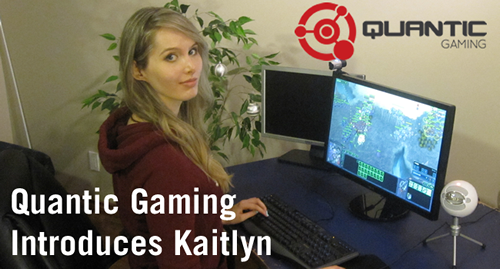 Quantic Gaming is proud to announce our newest player acquisition: Kaitlyn! She will be joining our StarCraft II Academy with the id "Quantic.kaitlyn" and will be streaming her ladder matches on her TwitchTV stream. The Canadian Zerg player has a degree in Electrical Engineering with a minor in Computer Science and has been actively working on her StarCraft II skills since graduating. She first entered masters league in Wings of Liberty. We had a chance to talk with Kaitlyn about her goals with the team and her experiences in eSports. Cute girl and she plays Zerg which is pretty strange since I don't think ive seen any to do that. Plus she is on the same team as Hyun so maybe she can learn a bit from him. Congrats for both of you. More female presence in esports is always great, good luck to Kaitlyn and grats to Quantic ! If I may ask, why does someone get the privilege to join a pro-gaming team and only be in Masters league? ^A lot of Pros are actually in Masters league, believe it or not. The main reason is because they're spending a lot of time elsewhere practicing. Best of luck! In this scene as a progamer, you'll need it! You have to understand shes joining the Academy Program where we shall train and guide her. Ha ha, Canadian EE? Maybe one day I'll end up working with her? Lol. Haha, I admit I'm just as jealous as the next guy as an aspiring Master myself. But this is good for her AND for the scene in general. We want more girls in the scene for 1)diversity. 2) to attract fresh (female) blood to the game. Plus, she's quite good, plays all races, and commentates while playing. What does that even mean... I guess being masters on all races isn't a bad feat. Congrats. Really happy for Quantic. Maybe they will pick up MsSpyte to! With scarlett taking a break someone will pick up the female gamer banner, maybe it will be her! If you don't know what it means, why do you do a "If I may ask"-flame in the first place? They have an academy for aspiring players who are not strong enough for their pro team (yet). Perfectly reasonable to get masters players here. I fixed it a bit to make more sense, sorry. I look forward to a day when the common response isnt "yaaay a girl" which then requires a followup of a post like this where we dream of a day. Congrats to Kaitlyn, hope they are able to teach you well. Sweet, another team picking up a token female player that isn't Scarlett. Prime, Azubu, Startale... which organisation will grab a random mid-masters chick for their team next, I wonder. you make it sound like if you arent offering scarlett all of your monies then picking up a girl is killing esports. shes an academy player and she got to masters on her own, she deserves this as much as anyone else. and even if she doesnt become the next scarlett, she wouldnt of been the first academy player for a pro team to fail to make it.